In 2015, Ironman South Africa witnessed a British podium sweep through Jodie Swallow, Lucy Gossage and Susie Cheetham - and all three were back this year. 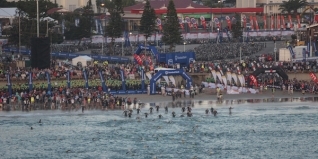 A bike crash would eventually force an injured Swallow out of the race shortly after T2, while Cheetham (second) and Gossage (third) were pleased with their results behind first time Ironman champion, Kaisa Lehtonen (FIN). Here are some images from the day. Eventual winner Ben Hoffman in transition. After a Sub-nine hour debut at Ironman Barcelona last year, Kaisa Lehtonen is an athlete making huge progress. Though not satisifed with her bike ride yesterday, her 4:56:10 split was only bettered by eventual fifth place finisher Annabel Luxford. Tim van Berkel (AUS) and Ben Hoffman spent much of the marathon running stride-for-stride. Lucy Gossage leaves T2 and heads out on to the marathon. It was close all day, but 'The Hoff', Ben Hoffman, would taken victory in the men's race. Despite the best efforts of the British duo, Finland's Kaisa Lehtonen was a deserving winner and would not be caught. She broke her arm at Ironman 70.3 South Africa in January, yet returned to take second place thanks to a fine run. A stunning effort from Susie Cheetham. An always expressive Lucy Gossage, enjoying the finish line at a race that she didn't for a while think she would be fit enought to even start. Despite the pain, all smiles for Lucy Gossage (third) and Susie Cheetham (second) at the finish. Both had overcome injury issues just to make the start line.